"Go, go, Mubarak go" and "the people need to end this regime" shouted the angry crowds around al-Istiqamma mosque in Cairo's Giza Square, as they shook their fists at the lines of helmeted riot police after Friday prayers. Within minutes, water cannon showered the demonstrators and there were loud thuds as tear gas canisters were fired. People ran into the side streets of this poor neighbourhood, on the edge of the capital, with their eyes streaming. "Let the world see what is happening in this country," yelled one elderly man. "We will never stop until this... government goes." Ordinary Egyptians appear to be losing their fear of direct confrontation with the security forces. 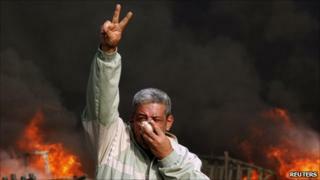 There have been bloody and drawn out clashes all over Cairo and in some of Egypt's main cities. They have a long list of grievances and the demands are an explicit challenge to their rulers. "We want a real democratic system. This regime of Hosni Mubarak has been in power for 30 years," declared Ahmed, a man in his 20s. "I was unemployed for five years. I had to move to the United Arab Emirates. This is what I was dragged into. My son will not suffer what I have suffered. This ends here." When you talk to people, they tell you economic reforms have not eased the poverty of Egypt's masses, education and social services are inadequate, and they complain of high levels of corruption and political stagnation. "We are so furious. We must have change, better chances to work, to buy a flat and have just the life's basics," said a bank clerk clutching an Egyptian flag. "What happened in Tunisia has changed things a bit. It knocked some sense into people." Opposition leader Mohamed ElBaradei - who joined worshippers in Giza - was swiftly moved inside the gates of the mosque as clashes began. "One, two, ElBaradei where are you?" was the cry that then went up outside. Some expressed disappointment that the Nobel Laureate - who set up the National Association for Change opposition coalition when he returned home to Egypt a year ago - had not taken a more prominent role in protests. He has put up supportive messages on his Twitter account but was absent, in Vienna, for the first "Day of Rage" on Tuesday. He returned to Cairo on Thursday night. "I support ElBaradei, my father wants (Arab League Secretary General) Amr Musa," one man said. "We could have ElBaradei or anyone else," added Amgad, who had brought his young children along to witness the protest. "We need change, not any specific person." The main opposition movement, the Islamist Muslim Brotherhood, subtly changed its message ahead of the latest protests. Despite the reported arrest of some senior figures, deputy leader Mahmoud Izzat spoke encouragingly of the protests. "People are demanding freedom, the dissolution of this invalid parliament. From the beginning this is what the young people have been shouting and we are with them," Mr Izzat told the al-Jazeera news channel. And he went on to criticise "the excessive force" of the security services. With multiple flashpoints across Egypt, many thousands of uniformed police, plain-clothed officers and paid thugs have been deployed. They line the bridges and main routes into central Cairo. While they remain strong and well-resourced, there have been unprecedented sights. In one case, a group of protesters tried to push an armoured vehicle into the River Nile. Attempts to close down mobile phone communications and access to Facebook, Twitter and Blackberrry messenger appear to have been ineffective in preventing the co-ordination of opposition activities. Demonstrators in the capital have simply regrouped in traditional gathering places downtown - such as Ramses Square and Tahrir Square. With Egyptians tuned into Arab satellite stations to watch dramatic scenes unfold, a curfew in Egypt's main cities was announced. However, as sirens blared on the darkening streets it was unclear how effective this will be.